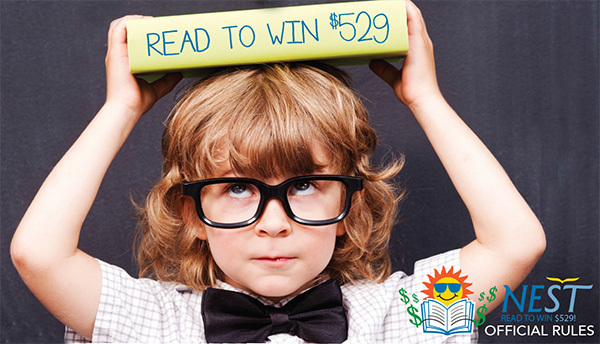 If you are participating in a summer reading program at a library and you do not wish to participate in the NEST Read to Win $529 Drawing, or you do not have parent or guardian consent to enter the Drawing, please contact your librarian or send your name, phone number, and local library name to nest@fnni.com. Nebraska’s 529 College Savings Plans (NEST), First National Bank of Omaha, Nebraska State Treasurer Don Stenberg and the Nebraska Library Commission announced today the NEST Read to Win $529! Drawing as part of library summer reading programs across the state. More than $11,000 in NEST 529 College Savings scholarships and donations will be awarded. For official scholarship rules, visit the NEST College Savings Plans at www.NEST529.com, the State Treasurer's Office at www.treasurer.org/csp/ or the Nebraska Library Commission at http://nlc.nebraska.gov.